Motorcycle Accident Eye Injuries | Hupy and Abraham, S.C.
An eye injury may not be life-ending, but it is life-changing and riders are at high risk of suffering this type of injury in a crash. Accordingly, it is important to know more about what causes eye injuries during a motorcycle accident, what kind of injuries may result, and what you can do to protect your recovery after you’ve been hurt. Wounds directly to the eye or very close to the eye. Any of these injuries requires immediate medical attention to help prevent the injury from worsening and to manage the injured rider’s pain. Of course, other types of vision problems may also occur. If you experience any change in your vision or any pain in your eyes or head, then it is important to get prompt medical treatment after your crash. Your medical expenses may add up quickly, your ability to work may be impacted by your injury, and your pain and suffering may be significant. 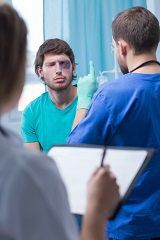 Accordingly, it is important to protect your legal rights as soon as you can after your accident. If someone else’s negligence caused your accident and your eye injury, then our experienced riders and attorneys will fight hard for your recovery. We will help you negotiate a settlement or seek a court verdict to recover your past, current, and future medical expenses, lost income, pain, suffering, and other damages. Don’t wait until it is too late to get a recovery; instead, call us at 1-800-800-5678 and let’s discuss your legal options. The Danger of Skull Fractures for Motorcyclists: Will You Recover? ?Who will pay for the physical pain and emotional suffering I’ve endured because of motorcycle accident injuries? ?What’s included in “lost income” damages after a motorcycle accident?